My love of the automobile began when I was three years old, the day I fell out of my parent’s 1968 Buick Wildcat and hit my head on the driveway. Since then, I have always been fascinated with automobiles, long before I could drive one…or I should say long before I could legally drive one because there were a few times prior to the awarding of that most coveted possession of every teenager that turns fifteen when I was known to get behind the wheel of a car and take it out for a test drive. I should also add that I hope my parents will forgive me for those things they didn’t know occurred back then and I also hope that my son doesn’t read this until he is at least out of college. It’s not going to help much whether he waits or not though, as cars are in his blood, just as they are in mine. He came by it honestly. In my family, there was one event that created more excitement than birthdays or Christmas and that was anytime a brand-new family hauler showed up in our driveway. I think the reason for this heightened state of enthusiasm over the newest member of the family was that the event itself was both unpredictable as to when it might occur and it didn’t roll around as often as those other two seminal events did. My father was not one to lay out a plan for replacing the car and when it happened, it was not the result of meticulous research on the merits of the particular vehicle…most of the time it was purely on impulse but what he was not usually impulsive about was his decision on what to get. My Dad was a Buick man. I suppose I should add that my Mom is a car person too. Unlike many women of her generation, she knew as much about automobiles as my Dad and to this day she has a passion for anything with four wheels, eight cylinders and enough horsepower to equip a cavalary brigade. While she loved the Buicks Dad came home with, she didn’t really care as much about the brand as much as she did whether the car could leave black marks on takeoff and could pin you to the seat under acceleration. Between the two of them, they owned a lot of cars but during my formative years, Buick was their main choice of automobile. Their first car that I have any memory of was the aforementioned ’68 Wildcat that I fell out of. How could I not remember that car considering that I may have received a concussion that day when I fell out of the passenger side onto the driveway? It was a gorgeous, bright red two door (my parents always had two door Buicks; that was what the younger people drove and since Mom and Dad were 21 and 22 respectively, that would place them in the two door demographic. The red Wildcat had a distinctive look with its sweeping side curves and flared taillights. For the time it was a very sporty automobile. I just liked it because it was red. Small kids love red cars. 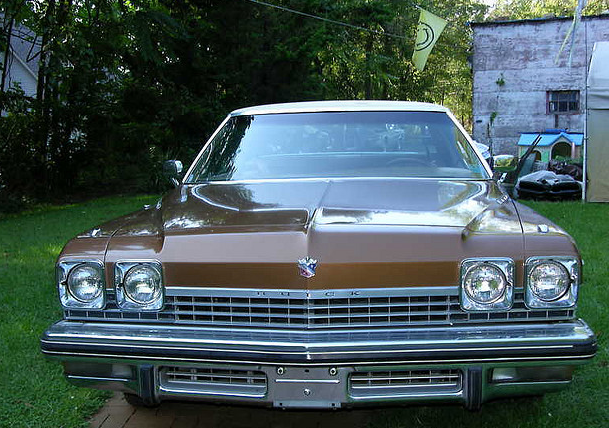 In 1972, Dad traded the four year old Wildcat in on a car outside the GM family. The car was some shade of yellowy-green that looked like cheesecake. From almost day one, they were never very happy with that car and its proper shade should have been lemon yellow because that is what the car turned out to be. Not only did the car fail to crank if the temperature ever got anywhere near freezing but it would also die on the road if you got above certain altitudes on mountain roads. It didn’t stick around long and Dad came home one day with a metallic brown Buick Electra 225. I think he gave the dealer the other car and a year’s supply of free barbecue to take it off his hands. The Electra was far different from the earlier Wildcat because it was considerably longer, bigger, and loaded with buttons and power accessories. Back then, if a car had air conditioning it was considered a big deal; power windows and locks put you chopping in high cotton and closing in on Cadillac territory. I don’t know how much chrome went into making that car but it was a lot and when it was clean and the chrome shined up, it looked like a million bucks. As it too was a coupe, it had doors so long that you had to give consideration to where you parked it just to make sure that you had enough room to open these mammoth buttresses without inflicting damage on the neighboring vehicles. While the Electra was a nice car, the color was the kind that one grew tired of pretty quickly and it wasn’t too long before Dad got new car fever again. 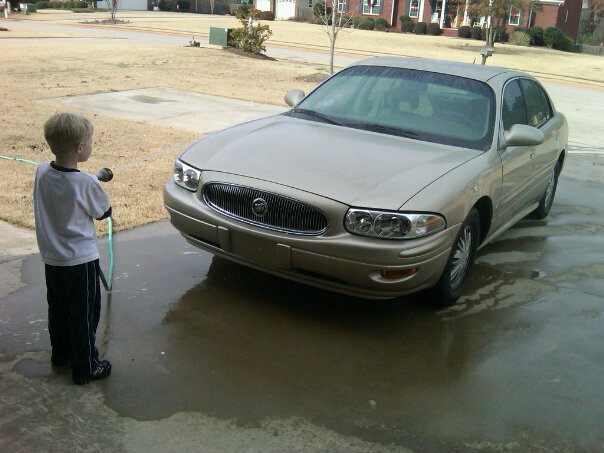 The next Buick that rolled in the driveway would be different and in many ways, special. Unknown to my brother and I, Dad had visited the Buick dealer intending to trade cars and found one that he couldn’t get immediately. In those days, dealers could custom order a car from the factory and configure it just about any way you might want it. This was not usually an issue for Dad because he could have never waited the amount of time necessary for a custom order to arrive but on this particular day, one had arrived for someone else and Dad wanted it. Badly I might add. Unfortunately, the car had been ordered for someone else and that someone just happened to be Mr. Sigmund of Sigmund Buick himself and being the owner of the Buick dealership, Mr. Sigmund had left a sparse few boxes unchecked on the list of options for his car. Fortunately, Mr. Sigmund was willing to sell the car but at his price. Dad went into full horse trading mode with him and from what I heard, it was a marathon event. Finally, Dad reached his “won’t budge” point and when Mr. Sigmund wouldn’t come down any further, Dad walked out of the dealership. A few days later, Mr. Sigmund called him back and agreed to meet him half way and Dad brought Buick number 3 home to stay. 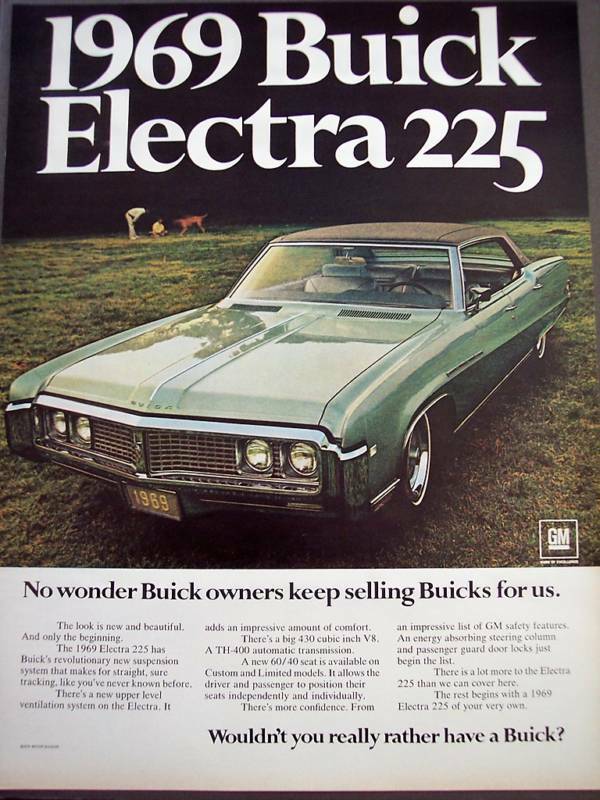 This Buick Electra, the 1976 model, was the pinnacle of Buicks in the 1970’s; after that, they would be put on a diet and downsized to a smaller form, along with the rest of the automobile industry so this last, truly leviathan Electra was the swan song of automotive largesse in the Buick line. To say this car was loaded would be a gross understatement; it had stuff I had never seen before and a couple of things I haven’t seen since (such as fender mounted monitor lights that let you know which lights you had on). It was a bright silver with alloy wheels and a couple of miles of chrome, topped off with a half padded vinyl roof that was so thick it could have been lifted straight off of a hearse. Inside, wine colored leather button tucked seats engorged the senses with the aroma of fine hides while elegant, hand-carved plastic wood door inserts with coffin pull handles and thick pile carpet completed an interior second to none. 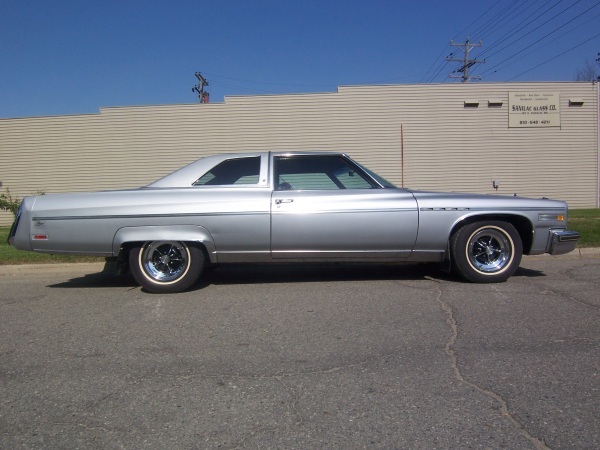 This car even required five names to properly designate it….the Buick Electra 225 Limited Landau (Landau was the model with the padded vinyl roof….it did not mean it was designed by actor Martin Landau). It was an elegant, long, cruising machine from the tip of its stand-up hood ornament to the rake of its canted tailights but it wasn’t the sheer size of the vehicle, nor all the interior finery that this ten year old was taken with….it was the Astro Roof. In 2011, a moonroof on a car is about as common as a Republican in Georgia is. In 1976, they were about as common as….a Republican in Georgia was. Seems there are a lot more moonroofs and Republicans in Georgia today than there was 35 years ago. This wasn’t just any moonroof though….this was a monstrous sized slab of glass that seemed to take up most of the forward half of the car’s top, from the Landau roof to the top of the windshield (I should clarify for those that don’t know that a moonroof is a glass roof that allowed you to see the moon through it at night whereas a sunroof is a metal one that you open to let the sun in). What was really fascinating to me was that with the flip of a switch located on the dashboard, a very loud motor would engage and this glass roof would slide back into the open position, turning the front seat into what could almost pass for a convertible-that’s how big this roof was. The Astro Roof was a lot of fun to have on a sunny day and we used to enjoy standing on the front seat as we went down the road, riding with our head out of the roof. Don’t ever open your mouth while doing this though. When Mom would run into the store or spend an hour in Mary Lee’s China and Gift Emporium, she would often leave us in the car if the weather was nice and she usually didn’t even take the keys with her. Keep in mind this was 1976, it was normal for parents to do that then and she figured if anyone kidnapped us they would bring us back and pay her to take us off their hands. My brother and I would quickly get bored from the lack of a handheld video game or a DVD to watch and we would begin playing with the Buick’s Astro Roof. He would stand up in the front seat with the upper half of his body out the roof while I would try to close the roof and pin him between the glass and the metal frame. Fortunately for him, the Astro Roof was pretty slow and he was pretty quick. My brother was not the only thing that was quick; that Buick would flat-out run. It had a 455 cubic inch V-8 motor (that is a 7.5 liter today) and was one of the largest motors GM every built. It needed every cubic inch of it to move this ark down the road with authority and once, when we went to pick up my mother’s ’78 Corvette from the body shop, my parents got into a friendly race with each other on a two mile long stretch of country road. Corvettes were notoriouly underpowered in 1978 and my father took great delight when the Buick overtook the Corvette and passed it somewhere north of the 100mph mark. Please keep in mind again that this was the 70’s, my parents were very young and their kids egged them on so we accept full responsiblity for our part in their misbehavior. My mother’s sister was also a Buick person but she perferred her Buicks more on the elegant side than the sporty side. She too had a ’76 Electra but hers was a four door model with a standard vinyl roof and wire spoke hubcaps. 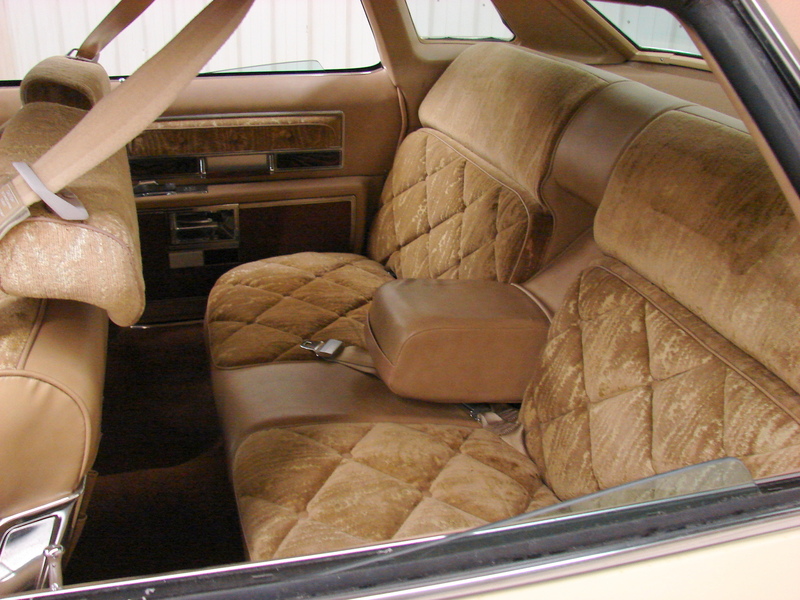 Her car had cloth upholstery that was some kind of crushed velour that could have been lifted from a Las Vegas lounge but it was very much in style at the time. She was bad about leaving her keys in the car and I remember when I was 12 or so, after one of our traditional Sunday-after-church dinners at my grandparents, I took a page out of my cousin David’s book and decided to take her Buick out for a spin. This was easy enough to accomplish; the driveway was some distance from the house, you couldn’t see where the cars were parked from the family room and the railroad between Atlanta and Macon ran just a few hundred yards from their house to mask any noise. Since a train was by every 15 or 20 minutes during the daytime, all I had to do was wait and sure enough, within a few minutes, I heard the train horn in the distance. I got into the car and waited, grateful that my aunt was short and that the seat was close to the wheel. She might have noticed if I had to move the seat. When the train was going by the house, I felt the noise level was now sufficient to mask the sound of an engine cranking so I fired up the car and began my first-ever drive behind the wheel of a real car. Like the Queen Mary leaving dock, the nineteen foot long Buick quietly eased out onto the street under the careful guideance of a twelve year old who had never driven a car in his life. They say that some people can learn skills just by watching others and without ever having had a single lesson. This was apparently the case as I must have absorbed driving skills from my parents by osmosis-that and driving Dad around on the golf course in a three wheeled electric golf cart. Laugh if you must, but a kid that can drive a golf cart well has already mastered the basics of steering, acceleration and braking, which are the three most fundamental aspects of driving. My grandparents lived in a small town of less than three hundred citizens, which consisted of a whopping six blocks of narrow, tree-lined paved streets. This time of the day, everyone was indoors enjoying their Sunday family visits and no cars were out so I had the road to myself. I cautiously drove the Buick up the street, around the block and back down again, taking care to put the car back exactly where it was. While the car was huge, parking it was easy thanks to overboosted power steering that allowed you to turn the wheel with a single finger if you wanted to. It’s probably a good thing that smartphones didn’t exist then or I would have probably done something stupid like post a status update: “Hey, look at me, I’m driving a real car”. I was pretty lucky that day. Nobody saw me, I didn’t damage my aunt’s Buick and I didn’t kill anyone. A couple of Sundays later, I took Mom’s car up street and around the block too but when I got back to the house, I ran into a small problem. Literally. I pulled into the yard alongside the driveway where we all parked, feeling full of myself and satisfied that I had once again successfully pulled off another drive. As the Buick glided toward it’s spot, I just happened to glance to my left and noticed my grandfather standing there with his hands on his hips watching me. I had seen this stance a few times before and it never bode well. A rush of panic went through me that was just enough to break the mental concentration I was using to park the car and as I stared back at him, I ran smack into a metal trashcan that he used to put limbs and yard clippings in. This was not good. Not good at all. I will always be grateful to my great-aunt Mary Lois from the neighboring town of Barnesville for saving my life because she came driving up for her Sunday visit with the family about that time. He held his temper, greeted her and her husband and sent them on up to the house. He then went over and picked up the trash can which now sported a nice crease in the side and set it back up by the garage. We both looked at the Buick and I quickly sent up a prayer to the Almighty, thanking Him for GM’s wisdom in equipping the Buick with thick rubber guards on the bumper. The car was complete undamaged. He turned to me and said “Better not ever let me catch you doing that again”. As he turned to head toward the house, he said “If you want to go driving, I’ll take you next time” and he walked into the house. He never told my mother or anyone else that I know of about that incident and I never pulled that stunt again. He was, as he always was, as good as his word too. The next time I came to visit them, we took his Chevy pickup truck and he drove it to the edge of town where the pavement ended and the dirt road began and let me take it from there. Of course, his truck was the kind with a column shifting manual transmission but that is a story for another time. Other family cars came and went over the years but no car ever quite had the same character as those guarantuan Buick Electras had. I never forgot them either, even though they have long since been turned into Coke cans. I guess they are part of the reason I still like Buicks and have owned two LeSabres, an Enclave and my current LaCrose. My son is now seven years old and just learned to drive a golf cart. He likes Buicks too. I guess I had better start hiding the keys to the LaCrosse. Disclaimer: The Author in no way endorses or advocates the driving of a motorized passenger vehicle by twelve year olds or that parents should ever leave their children unattended in a car with the keys in it. Electric moonroofs should only be used under adult supervision and should never be used to pin or otherwise entrap other children as serious injury or death could occur. Children should never ride with their heads sticking out of the roof as possible decapitation may result. Adult drivers should never race automobiles with their children in them, no matter how loud they are cheering them on. Toddlers should always be restrained and never allowed to freefall out of a car onto the pavement head first. Always wear safety belts. Objects in mirror really are closer than they appear. Seriously. No, Daddy never did tell me nor did Hershel Harris ever tell him that he and his tractor pulled me and Daddy’s brand new Cadillac out of the mud when I was 13. I guess there is a streak of insanity in us when it comes to cars, I learned from an expert and you did too. The part about the moonroof you didn’t have to tell, some things are better left unsaid. I always stopped the roof just in time. He was never in any danger but he didn’t know that.